Even today, two years after Bhopal Gas Tragedy thousands of victims continue to suffer from a chronic form of illness with clinical manifestation indicating multisystem involvement This study has been done to evaluate the sequalae of acute ocular lesion of Methyl-Isocyanate gas disaster. In this study 2280 patients who had an active lesion on the exposure of Methyl-isocyanate gas were picked up from the affected area. Another2000 were taken from unaffected area of Bhopal city of the same social status for the purpose of control group. Methyl-isocyanate (MIC) (CH 3 NCO) is an extremely toxic chemical. NCO being the highly reactive group. The latter participates in actions with Biological substances, most of the effects being due to acetylation or `Carbamylation'. It is highly irritant to the site of contact leading to necrosis of tissues In mild cases there was only conjunctival hyperaemia; in moderate and severe cases, Kerato-conjunctivitis developed. A band-shaped epithelial denudation in the interpalpebral fissure was the characteristic lesion. Whether or not these victims run an increased risk of developing further complications, long term follow up of these patients were carried out in Eye Department of Hamidia hospital, Bhopal (In period from December, 1987 to November, 1986). In this study 2,280 patients who had active lesion on the exposure of MIC gas were picked up from the affected area. Another 2,000 were taken from the unaffected area of Bhopal city of the same social status for the purpose of control group. A detailed regular follow up of these cases was done, which includes slit lamp examination, corneal Endothelium study by specular microscope, estimation of the refractive error, fundus exami­nation, shirmer's test tear film break up time (BU.T.) Ph of tear and Rose Bengal staining to evaluate the nature of various chronic ocular lesion, resulting from chemical Disaster. The acute ocular lesions caused by MLC gas was similar to chemical injury caused by weak acid. The symptoms comprised, of severe burning, foreign body sensation, lacrimation, inability to open eyes and blurred vision. The manifestations seemed to be proportional to the duration of exposure and concentration of MLC gas. In Mild cases, there was only conjunctival hyperemia. In some of the moderate and severe cases, keratoconjunctivitis developed. The involvement of cornea varies from mild comeal lesion to large epithelial defects It has been noted, that the percentage of comeal oedema which was 7% in first six months gradually reduced to 5.5%. 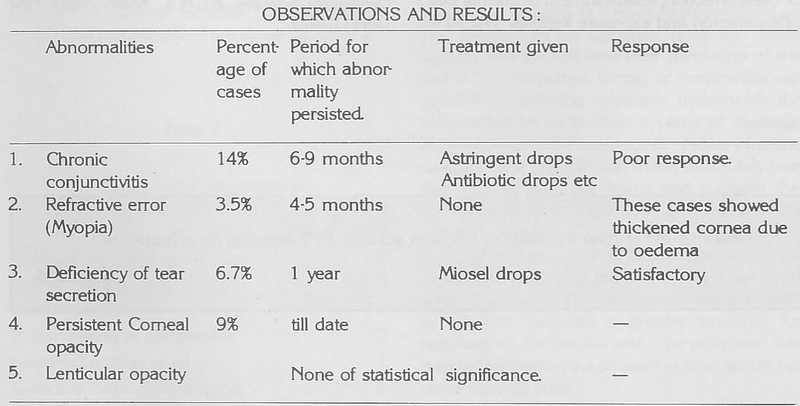 In the control series it was nil, while the deficiency in tear secretion remained constant in the whole follow up period. Some patients, continue to complain of irritation in eyes and mild degree in reduction of vision This may be attributed to persistent corneal oedema and deficiency in tear secretion, These cases are treated by mild astringent solution and antibiotic drops. Ind J. Ophthal, 1982, Vol. 30, No. 1. Illis, Ocular Therapeutics, 1976, p. 210-212. AR Keeney, Ocular Examination Basic and Technique, 1976, p. 13-14. Duke Elder, System of Ophthalmology, 1982, VoL V1II, p. 124-125.